Dapoli is a town in Ratnagiri district, Maharashtra. It is 215km from the state capital of Mumbai. Dapoli is also called as Camp Dapoli as British set their camps in Dapoli. Many high rank British officers' Graves are in this Town. Dapoli also has an old abandoned church from British times. Dapoli is home to one of the biggest Agricultural Universities in India Dr. Balasaheb Sawant Konkan Krishi Vidyapeeth. Dapoli is administered by the Dapoli Municipal Council.GeographyDapoli is separated from the Sahyadri range by the Khed taluka. Dapoli has a seaboard of 50km which stretches from Burondi, Kelshi to Dabhol. The coastline differs little in its general characteristics from that of other parts of Konkan. It is densely covered by coconut farms. The principal rivers are Bharja in the north and Vashishthi in the south. 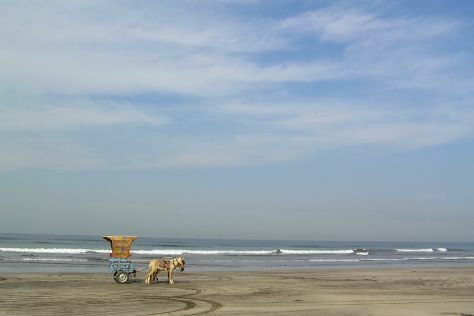 A small river called Jog flows through Bandhtivare, Sarang and Tadil into the Arabian sea.The town is located at an altitude of 800ft. It is also called "Mini Mahabaleshwar" because of its cool climate throughout the year. It is 8km from the Arabian Sea and acts as the main town (Taluka headquarters) for several small surrounding villages such as Agarvayangani, Anjarle, Mandivali, Sarang, Bandhtivare, Pangari, Dabhil, Bhopan, Harnai, Dabhol, On Navse, Unhavare/farare, Jalgaon, Gavhe, Gimhavane, Asud, Vanand, Kherdi, Karde (beach), Pichdoli, Visapur, Onanavase, Murud and Umberghar. Dapoli is in Ratnagiri District. Our India trip builder website combines visitor reviews with your personal interests to make an itinerary informed by experts, but tailored to suit your style.